Categories > The Open Forum > In the News/Announcements > O.O.P.S Magic and Mentalism. My new book is out. I wouldn't say it's my best book, but it's out anyway. How's that for under-hyping something 😉 Your favorite dealer can obtain it from Murphys. Hi Paul, congratulations on your latest book! Are there any items in here with cards? I’m not much into mentalism. 50 items taught. That’s a lot of magic packed into this book! 50 items! Holy smokes! I may need to check this out. And the unbelievable hype behind this! "I wouldn't say it's my best book, but it's out anyway." Yes, there's some card stuff in there. Probably more than there is mentalism to be honest. The content is just a little bit more varied than my other books. One mentalism idea is just a presentational suggestion and idea starter. Some use cards but not playing cards . Even some packet tricks. Exciting! I love Paul's OOPS All Cards book. I'm sure this one is just as great. Paul's material is always practical and well thought out for the professional and within the abilities of the amateur. Nothing to do with the book discussed but interesting to me --- I read "Wows" and "Holy Smokes" over 50 items in a book Hey guys - ONLY MY APOCALYPSE has 75 items! And JAW DROPPERS TWO has 84 items! And my upcoming book - if I ever get it done - AND FINALLY! - will have about 70 items. Wow! Holy Smokes! Thanks Harry, I'd not heard you had any books out recently on this forum. Maybe you need to mention it on every thread. I smell something here --- but I sure am gonna' keep trying - on every thread where it seems apropos. I just don't particularly like to start a thread with one; nor do I know HOW to start a thread with one. Wish I could do 'em as in the first post in this thread - I'm just awful with the new technology - I have no way of posting a picture of an upcoming book, or of any book; don't know how to do it. There are, however, if anyone would like to see them, pictures of all my books - including, of course, those that have 70, 75, 84 items - at harryloraynemagic.com. I'm too lazy to count the number of items in each of my L:TCC volumes, but probably in the 70+ area. I smell something here --- but I sure am gonna' keep trying - on every thread where it seems apropos. I just don't particularly like to start a thread with one; nor do I know HOW to start a thread. Wish I could do 'em as in the first post in this thread - I'm just awful with the new technology - I have no way of posting a picture of an upcoming book, or of any book; don't know how to do it. There are, however, if anyone would like to see them, pictures of all my books - including, of course, those that have 70, 75, 84 items - at harryloraynemagic.com. I'm too lazy to count the number of items in each of my L:TCC volumes, but probably in the 70+ area. Harry, if you look on the categories and click on "The Open Forum" which is third one down. When that one comes up, click the top one "In The News". Look to the top right of all the threads and you'll see a "New Topic" tab. Click on that and a blank post comes up, at the top left you'll see your curser when you can put in a subject heading (type in the title of one of your books). You can then post underneath all your advertising blurb, etc. You could do that for each of your new books so each has its own thread. People could then talk about those books and favorite tricks in them etc. There's nothing wrong with starting a thread about a new book here on a forum where you post so often. I promise not to mention my books in your book threads. I just picked up a copy of "Son of TOTAT" - full of clever material! I think your books are great. What does O.O.P.S. stand for? Okay, thanks, Paul - I'll try it when I get a chance or when/if I need it. Believe me - I'll probably louse it up - I'm afraid I may blow up Newburyport!! Wow, Robin don't see many of those around, what's the copyright date in that one? That's the one where I named every trick after a movie 😉 First edition I home produced, then Magick Enterprises in Sheffield took it over and gave it a different cover design. O.O.P.S stands for "On Other People's Shoulders". There's very little that's not inspired by something else these days. I always thought it was about quality rather than Quantity. For example, one manuscript for Deja Voodoo is better for me than 70 card tricks. Especially when I already have forgotten 70 card tricks (okay way more than 70) that I would never use anyway. Indeed it is. But the real secret is quality and quantity. Manage that and then you’ve got something. It’s all a matter of taste, as ever. 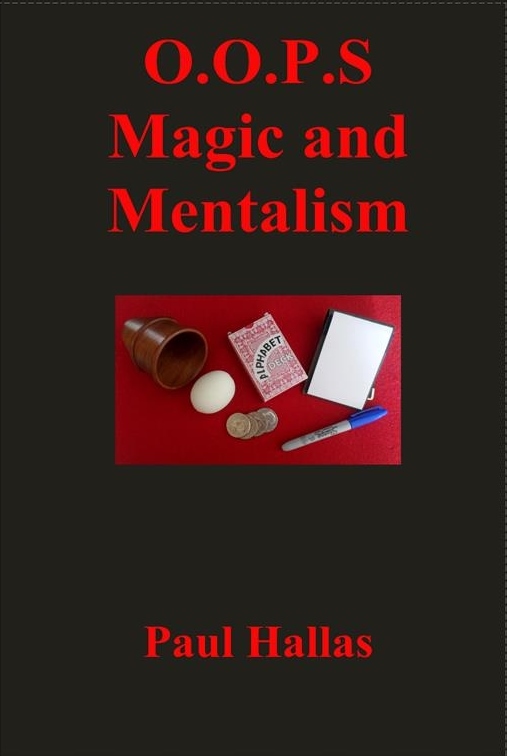 I haven’t seen OOPS Magic And Mentalism, but I have several of Paul’s books (about a dozen) and I like them. Quality and quantity. Copyright 1992 - it says "Cover design and artwork by P. Hallas"
A few more reviews are starting to appear. Nice to see it has been described as a goldmine. Someone e-mailed to say they were using "Twelfth Night" the same day they read the book. If you have the book I'll point out that in the chop cup routine there' s a paragraph where the words left and right are transposed (p.32). Unless you're a contortionist it will probably have been obvious but just thought I'd mention it. It's always amazing what can slip through the proofreading.